Online retailer AnotherUniverse.com released exclusive chromium covers for the first six issues of Dark Horse's 1998 Star Wars title. The six issues are part of the Prelude to Rebellion story arc. Jedi Knight Ki-Adi-Mundi is on his homeworld of Cerea. An off-worlder, Bron, is inciting a rebellion in the young Cereans who want to embrace technology while the elders who lead the society have shunned technology. One of Ki-Adi-Mundi's estranged daughters, Sylvn, supports the pro-tech movement and Ki gets caught up in a serious of events that will see him pursue his daughter all the way to Tatooine. The cover artwork on the AnotherUniverse.com exclusives is the same as the standard covers. The difference is the exclusive covers have a chromium coating that is both glossy and thick. Ken Kelly provides the cover artwork for issues #1 - 3, 5, and 6, while the cover for issue #4 is by Dan Brereton. 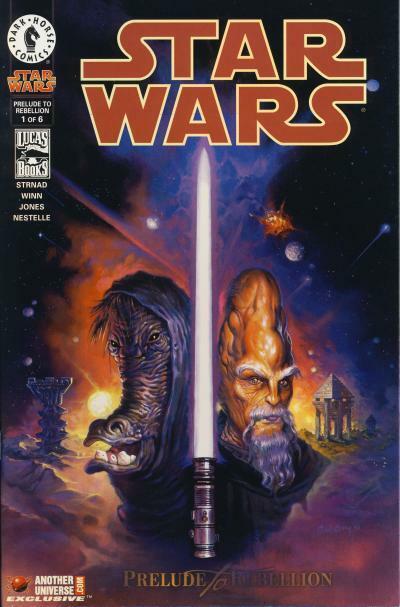 The first cover shows Ephant Mon and Ki-Adi-Mundi. Ephant Mon, a background character in Jabba's palace in Return of the Jedi, is the main antagonist in the story and is illegally smuggling a rare mineral, Malium, off the planet. He is also illegally smuggling and selling technology to the Cerean youth to finance his operations. Sylvn's boyfriend, Maj-Odo-Momor, accidentally kills another Cerean at a pro-tech rally in the first issue using Ki's lightsaber and Ki is framed by Bron. He is quickly found innocent and is asked by the Cerean elders to bring Maj to justice. 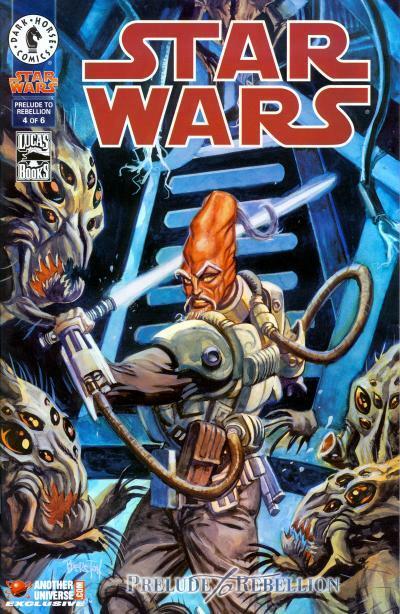 He travels to one of the Republic citadel on the planet looking for clues and the second cover shows Ki-Adi-Mundi fighting off-worlders in the citadel. In the citadel, Ki-Adi-Mundi finds Ephant Mon's deserted hideout. Ephant Mon has already been told Ki is pursuing him and he evacuates the planet with Sylvn, Maj, and another of Sylvn's friends, Twin. He leaves behind a droid that attacks Ki as shown on the cover. Ephant Mon is delivering a Hutt delicacy, Divvik pupae, to Jabba, but the pupae hatch, trapping Ephant Mon, Sylvn, Maj, and Twin aboard a freighter in orbit over Tatooine. Ki travels to Tatooine to rescue his daughter. As the cover shows, he boards the freighter and must fight off the hatched creatures. A 3-part tale begins in issue #4 that chronicles the events around Ki-Adi-Mundi becoming a Jedi. His parents are at first reluctant to allow the Jedi to take the young Ki, but when their farm is raided by Bin-Garda-Zon's raiders, they acquiesce to the Jedi's wishes since they feel a Cerean Jedi could defeat Bin-Garda-Zon. Years later, a trained Ki returns to Cerea to seek justice, but learns that Bin-Garda-Zon has been replaced by a woman. 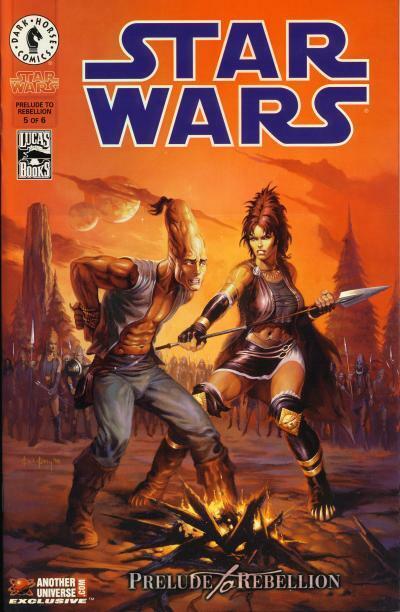 The cover shows the battle between a young Ki and the woman who leads the raiders. 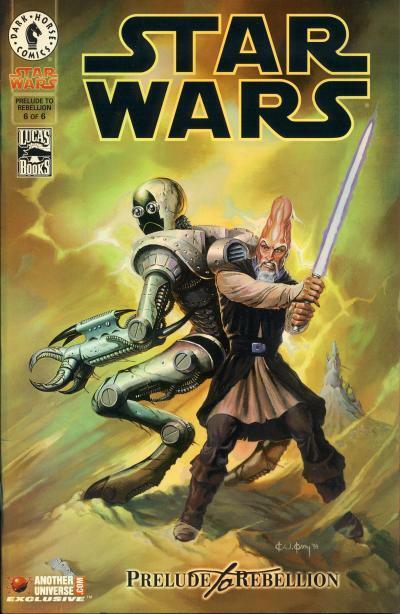 The final cover shows Ki-Adi-Mundi and the droid he fought in the citadel. The droid, FLTCH R-1, was reprogrammed to help Ki on his mission. The pair are on the surface of Tatooine in the middle of a storm. Dan Brereton has a unique style that is easily identifiable. The cover on issue #4 is not one of his better pieces. It is worth checking out some of his other work, specifically his creator-owned title Nocturnals, to get a better appreciate for his style. In every Star Wars movie, there is a plethora of characters to be found in the background. In the first movie, the Mos Eisley cantina that Luke Skywalker and Obi-Wan Kenobi enter to hire a pilot is our first glimpse at the abundance of alien species. 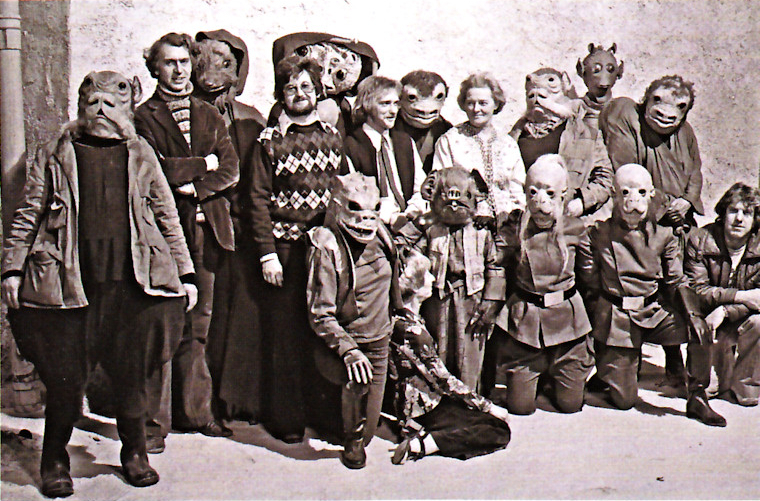 Many of these aliens were first named and given a backstory in the West End Games' Star Wars: The Roleplaying Game which was published from 1987 to 1998. As an example, West End Games gave Hammerhead his official name, Momaw Nadon, as well as a backstory. This roleplaying game proved to be a huge influence on the Expanded Universe. A card game from Decipher, the Star Wars Customizable Card Game, started publication in 1995 and continued the tradition of naming characters and providing them a backstory. Decipher was responsible for first giving BoShek his name, for example. Bantam Spectra published an anthology novel in August 1995, Tales from the Mos Eisley Cantina, comprised of many short stories featuring background characters found in the cantina. Of course the cantina denizens that are better known because of their Kenner action figures, like Momaw Nadon (Hammerhead), Ponda Baba (Walrusman), and Greedo receive a story in the novel, but the book also has tales for characters only briefly seen onscreen. One of these lesser known characters, BoShek, stars in the story At the Crossroads: The Spacer's Tale. BoShek would not star in a story again until Empire #23 is published nine years later in August 2004. The Bravery of Being Out of Range takes place on a backwater planet named Stoga. The story starts with BoShek and Rasha Bex on a swoop bike being chased by Rebels led by Karn. BoShek is taking Rasha to her friends who are going to provide her transportation off the planet. Rasha tells BoShek she is being pursued by her former associates, the Rebels, because she decided to leave the group and they thought she knew too much about their operation on the planet to let her live. They escape and BoShek decided to hide out at his friend Tam's place. BoShek and Rasha talk before they slumber off and we learn that BoShek is a smuggler who ran afoul of the Empire and was hiding out on Stoga while Rasha is committed to the fight between the Empire and the Rebellion. BoShek is woken when he hears Tam talking to Karn and the other Rebels that were chasing them. BoShek and Rasha, riding another swoop bike, are again pursued by the Rebels and they again escape, meeting up with Rasha's friends. We learn that Rasha is the Imperial spy Captain Bex and her friends are Imperials who begin a ground assault against the Rebels. Rasha tries to convince BoShek to join the Empire, but he is not interested. Instead he is taken prisoner and loaded on an Imperial Shuttle. 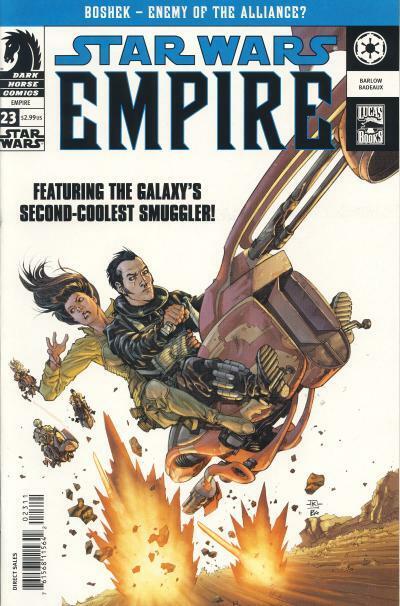 The cover shows BoShek and Rasha riding a swoop bike. BoShek is wearing the outfit he wears in the cantina on Mos Eisley. 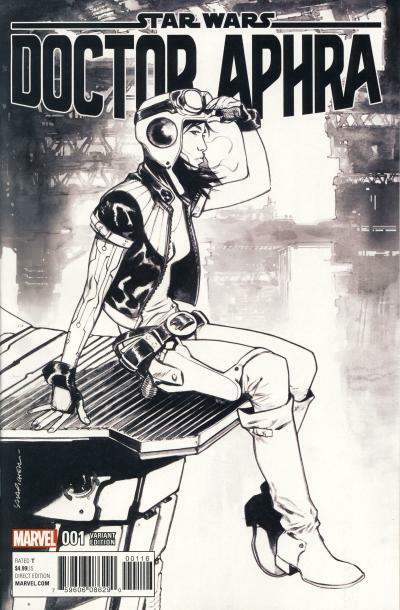 The cover blurb reads Featuring the Galaxy's Second-Coolest Smuggler! Journey to Star Wars: The Force Awakens is the brand name for the publishing strategy at the end of 2015 that included books and comics that tied into the film. None of the books or comics are required reading to understand the movie, but they do provide backstory and augment the experience for fans. 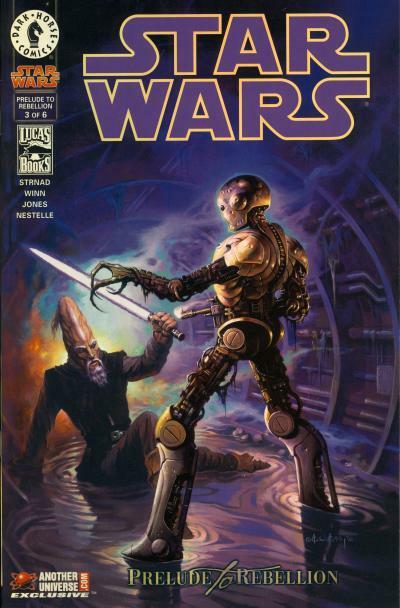 Marvel originally had two titles that were part of this program, but only the 4-issue mini-series Shattered Empire, was released; the other title, Star Wars Special: C-3PO, was delayed until the following year. Eight retailers commissioned an exclusive cover for the first issue of the Shattered Empire title. Altogether there are sixteen variant and exclusive covers for Shattered Empire #1. One retailer that released an exclusive cover is Yesteryear Comics located in San Diego. The artist for this cover is Mike Mayhew who has provided interior pencils for several modern Star Wars issues in addition to covers. The artwork is a montage showing our heroes surrounded by soldiers and tools of the Empire. Both the artwork and the title are angled which helps this cover stand out from the others. Overall, I really like the cover except for two changes I would have made: Lando Calrissian should be included instead of Obi-Wan Kenobi and Luke Skywalker should be dressed in his Return of the Jedi garb. A similar publishing strategy is being used for the latest movie with the Journey to Star Wars: The Last Jedi branding. Marvel's Captain Phasma mini-series is being published as part of this program. 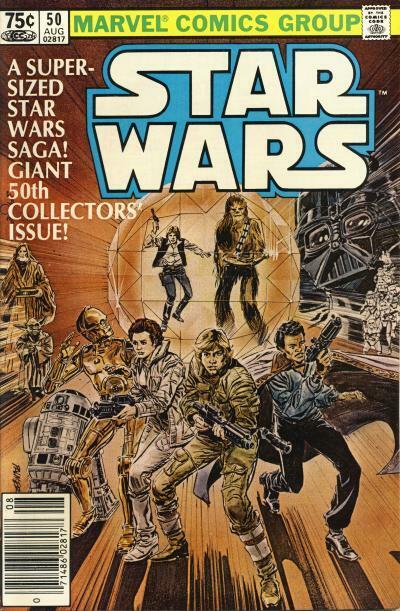 Star Wars #50 is among the best issues published in the original Marvel run. It is the final story to feature any member of the House of Tagge who were prominent adversaries for our heroes in the title prior to The Empire Strikes Back. It also features pencils by the incredible Al Williamson who is one of the best artist to have worked in comics. The cover artwork is by Tom Palmer who worked on many Star Wars comics, including inking the covers for the first three issues! The art is nice, Darth Vader's visage notwithstanding, and I like how the jewel and Darth Vader's helmet intermingle with the logo, but one thing that is noticeable is the lack of primary colors. There are hints of gold in C-3PO and Lando's cape should be red with gold trim. Even Lando's signature blue shirt is washed out. Whether on purpose or by accident, the cover looks aged; it is like you are looking at a drawing that has faded and darkened over time. Since the story is titled Crimson Forever, it is interesting that brown is the dominant color rather than red. Titans #50 does not use the same artwork, but instead uses an inferior redrawn cover. In the original artwork, the lines extending out of the jewel give the impression that Obi-Wan Kenobi, Yoda, Darth Vader, and the Stormtroopers are memories and that effect is lost on the French cover. 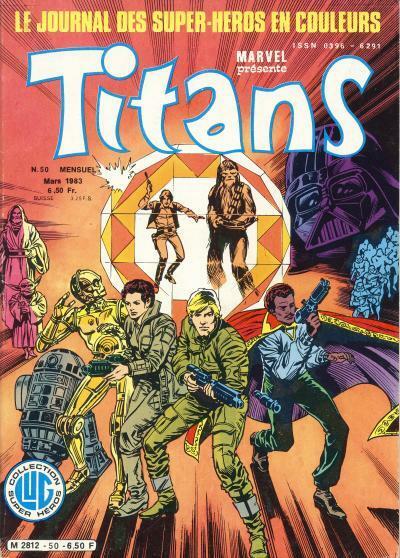 The French cover also distorts Luke Skywalker and C-3PO's faces. R2-D2 looks like he has his 3rd leg extend on the U.S. cover and the French cover instead adds an additional part to R2-D2's torso that looks strange. Much of the detail found on the Stormtroopers is missing as well. The French cover does use primary colors; C-3PO is gold and Lando's cape is red with gold trim. Even Lando's shirt is clearly light blue. Strangely, R2-D2 is not white and the white Hoth outfit Princess Leia is wearing is now a shade of brown. The overall radiance emitted from the jewel is red however, which is appropriate. It would be interesting to see the original artwork recolored with a more colorful palette. The French cover offers hints at what the cover would look like with primary colors, but fails in the execution and instead is just a rushed knock-off of the original. 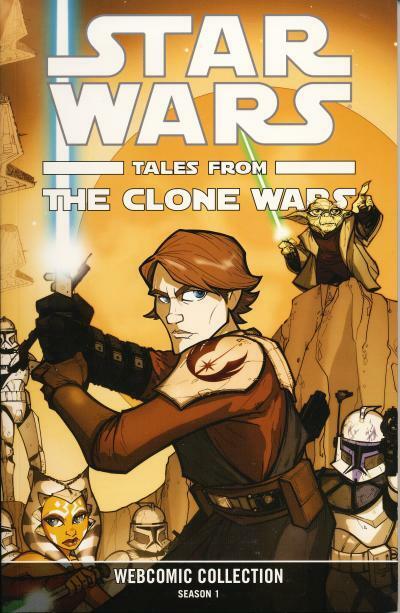 There were several online comics published on StarWars.com in conjunction with the first three seasons of The Clone Wars television series. For season one, 21 online comic shorts were created for the broadcast episodes with artwork by a variety of artist. The earliest shorts have artwork that looks rushed, but by the end of the first season, the artwork had improved from all the contributing artists. I feel the work provided by Jeff Carlisle is the most polished, but unfortunately he contributed the fewest pages. These first season of online comics are collected in a trade paperback published by Dreams and Visions Press in collaboration with Dark Horse Comics. The trade paperback was originally a Celebration V and StarWarsShop exclusive, but it apparently can still be purchased from the Dreams and Visions Press website. There is a copy of this trade paperback listed on eBay with an asking price of $363.75. It also says the book is limited to 500 copies. I have not found any other source that can backup the 500 copy claim. If you are looking for a copy, it might be worth seeing if the book listed on the publisher's site for $25 is still available. The deleted Jabba the Hutt scene was reinserted into A New Hope for the Special Edition released way back in January 1997. A CGI version of the large, slug-like alien from Return of the Jedi was placed over the actor who originally played the part and other elements of the scene were manipulated including the insertion of Boba Fett. The initial CGI used for Jabba were not very good, so when the movies were released in 2004 on DVD, the CGI effects were updated. 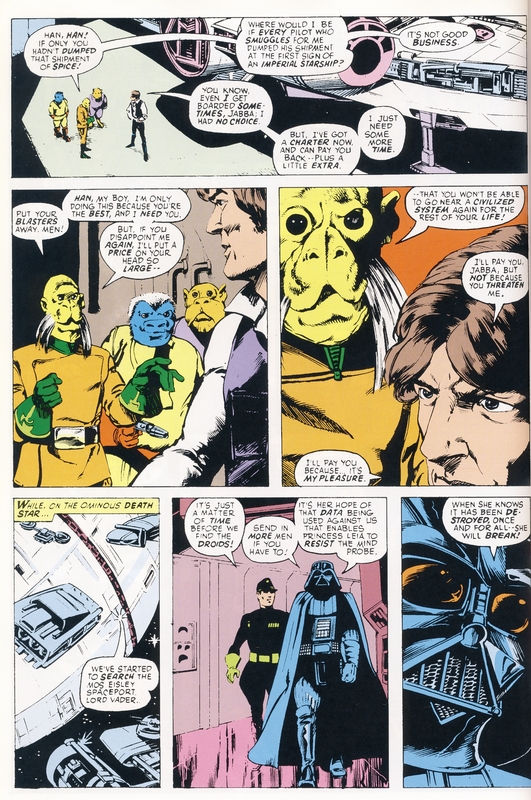 Prior to his appearance in Return of the Jedi, the image many Star Wars comic fans had of Jabba the Hutt were based on Marvel's comic adaptation of A New Hope. 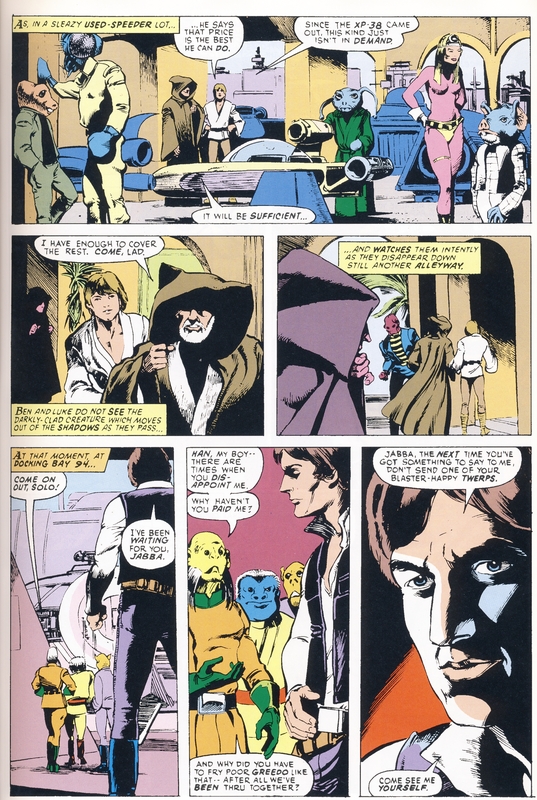 The deleted scene where Jabba confronts Han Solo at Docking Bay 94 are in the comic, but instead of using the image of the actor, a walrus faced alien is used. Outside of the visuals, most of the scene plays out like it does in the movie. Jabba, surrounded by his henchmen, is calling out to Han believing he is aboard the Millennium Falcon. Han approaches from behind and Jabba mentions the incident with the spice. Han explains why he dumped the spice and promises to pay Jabba extra. Jabba accepts Han's offer, but warns him of the consequences of failing to pay him back. If you look closely at the artwork in the panels showing Jabba and his men, the blue-faced alien that looks like a Snivvian even has a hunchback. The three short stories are for all ages. Probe Droid Problem follows one of the three probe droids released by Darth Maul on Tatooine. The probe droid rescues another droid trapped under a rock, gets captured by Jawas, and in return is rescued by the droid it helped earlier. The probe droid is reunited with the other two probe droids but decides to stay on Tatooine with its new droid friend. R2-D2 is the star of Droid Dilemma. Luke Skywalker is given orders by Princess Leia to look for a missing cargo vessel. Luke asks R2-D2 to prep his X-Wing Fighter and R2-D2 keeps running into other familiar droids on his way to the hanger. When R2-D2 finally reaches the hanger, Luke informs him the cargo vessel just arrived and the mission was canceled. This story is noteworthy because it is dedicated to Kenny Baker who died in August 2016. The final story, SaBBotage features BB-8 helping a Resistance pilot and mechanic who are interested in each other romantically to meet. 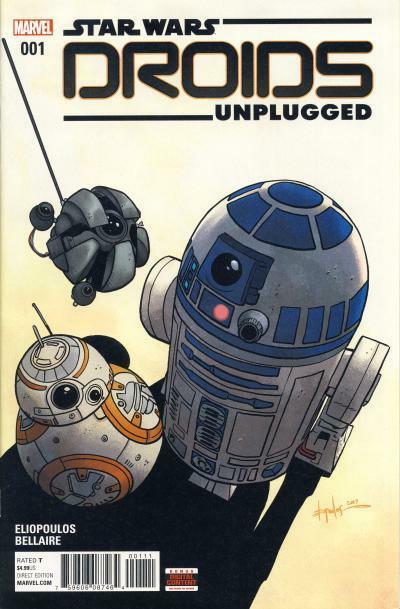 The standard cover by Chris Eliopoulos shows the three droids who star in the stories. The variant cover is by Michael Allred, best known for his creator owned character Madman. This cover is the more interesting of the two; it shows the three droids but also a myriad of other familiar droids floating in space. For a title containing recent reprints, the issue sold very well, with initial orders of approximately 36,000 issues. Eliopoulos and Bellaire also created a backup story in Darth Vader (2017) #1 which is about a mouse droid preparing Darth Vader's chamber. 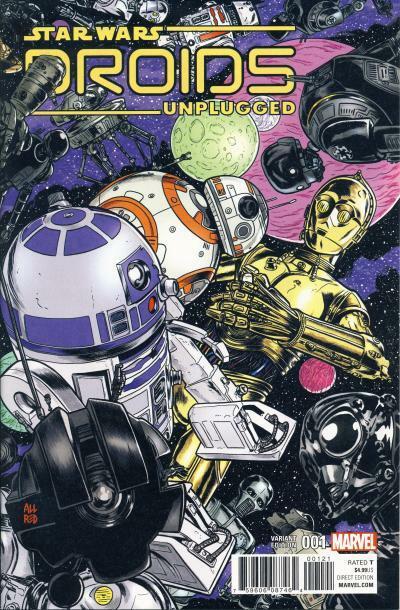 I suspect we'll get more of these droid backup stories and Marvel will publish a second Droids Unplugged comic. 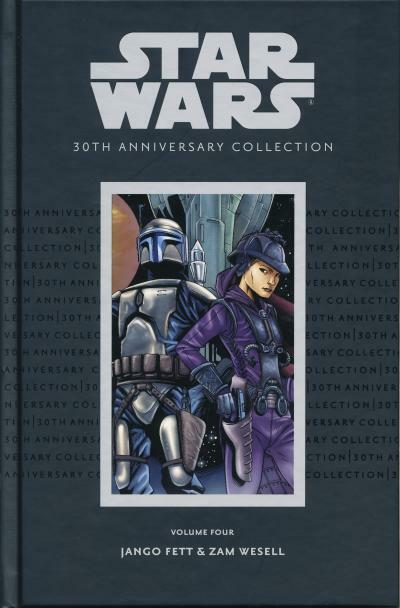 The fourth volume in the Star Wars 30th Anniversary Collection from Dark Horse reprints the two 64-page one-shots, Jango Fett and Zam Wesell. It has the same matte black cover with silver text that the other books in this series have. Framed in a silver box in the center of the cover is a portion of the artwork from the final page in the Zam Wesell one-shot. This hardcover volume retailed for $19.95 and was limited to initial orders. The two original one-shots came out in 2002 before Attack of the Clones, the movie that debuted the characters. The story in the Jango Fett title leads into the story in the Zam Wesell title. Both characters appear in both one-shots. Jango Fett's first appearance was in the Star Wars: Jedi Starfighter video game which came out March 10, beating the comic by three days. Zam Wesell's first appearance is in the Jango Fett title however. 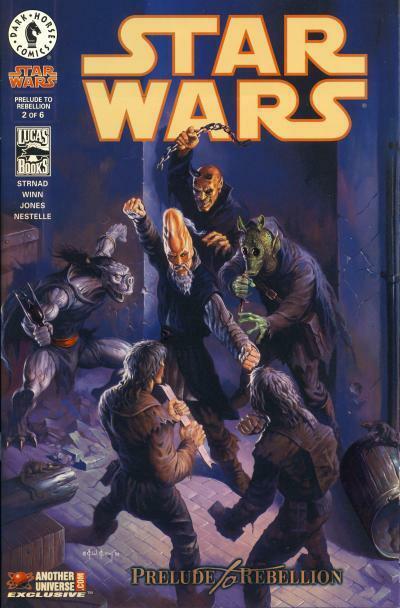 Dark Horse has done this before, they began publishing the 1998 Star Wars title starring Ki-Adi Mundi a full six months before The Phantom Menace and published the prequel movie adaptations a few weeks before the actual movies were released. Interestingly, Marvel has not published any movie tie-in starring characters from the movie prior to the movie being released. 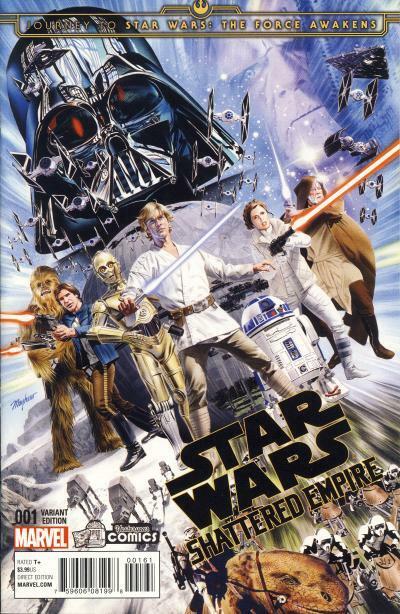 They did release the four issue mini-series Shattered Empire in 2015, but it did not have any movie characters. Marvel also had plans in 2016 to release a three issue mini-series prelude to Rogue One which presumably would have starred characters from that movie, but that mini-series was rumored to be canceled due to the extensive reshoots done for that movie. This year, Marvel is publishing the Captain Phasma mini-series, but that character has already appeared in The Force Awakens and they will be publishing a mini-series taking place on the planet Crait, but that will happen after The Last Jedi is already out in theaters. 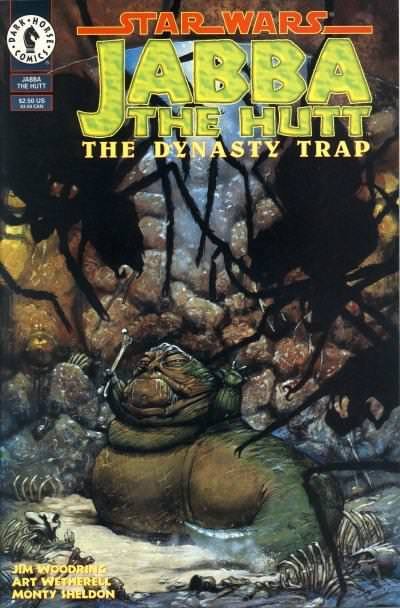 Jabba's callousness is on full display in Jabba the Hutt - The Dynasty Trap. Having taken the treasure from Princess Nampi's ship, Bib Fortuna suggest Jabba sell the ship to Cabrool Nuum who has a nearby base on the planet Smarteel. Jabba ponders selling Cabrool the ship's crew as well since Cabrool also deals in slavery, but instead decides to eject them into space and watch them die. He does take the ship to his colleague Cabrool however. While meeting with Cabrool alone, Cabrool's kids, Norba and Rusk, interrupt and Cabrool shows his irrational temper by threatening to kill his own kids. He eventually comes to his sense and Jabba asks about Cabrool's associate Vu Chusker. Cabrool becomes suspicious and orders Jabba to kill Chusker, but Jabba refuses. Cabrool, again unhinged, orders his men to put Jabba under house arrest. Later, Rusk enters Jabba's quarters and tells Jabba his father has gone insane and ask for his help in killing him. Jabba agrees and strangles the sleeping Cabrool in his chambers with the help of Cabrool's guards. After his father's murder, Rusk orders Jabba to kill Vu Chusker and Jabba again refuses. Rusk has his men take Jabba to the hold where Norba appears and appeals to Jabba to kill her brother Rusk. Jabba agrees and Norba leads Jabba to her brother who Jabba squishes to death by jumping on him. Norba, also fearful of her dad's former associate, asks Jabba to kill Chusker. Jabba refuses and Norba has Jabba thrown into the hold. Later, Norba comes down to talk to Jabba but gets to close to the hold's bars and Jabba grabs her with his tongue and swallows her whole, presumably killing her. As Jabba is leaving the base, he encounters another being. Upon learning that this being is Vu Chusker, Jabba smacks him with his large tail, killing him. Jabba has a shrewd side in these one-shots where he appears humble and presents himself as subservient to his colleagues. This is part of his act to get them to do his bidding or to garner a better deal. In this story, Jabba is able to get a higher offer from Cabrool for the ship for example. But when those same colleagues wrong Jabba, he also has a ruthless side. Jabba is not above murdering anyone and, as this story shows, he is willing to do this dirty work himself. The cover shows Jabba in the hold at Cabrool Num's base. The artwork makes it appear like Jabba is defending himself against spider-like creatures, but inside the comic, Jabba is never in this situation. There are spider-like creatures that drop from the ceiling, but Jabba nonchalantly grabs one and eats it. From the description, it appears Luke Skywalker and Princess Leia help establish a Rebel base on Crait. Read more in the post Leaked Marvel December Comic Book Solicitations over at Reddit. Star Wars #49 has received considerable attention since the title of it's story, The Last Jedi!, is the same as the upcoming movie. The prices have settled down somewhat, although the issue does fetch a premium over others that surround it. The thing is a walking parody of Luke Skywalker's highest, most revered goal ... and it makes his blood boil! Luke Skywalker: Keep this crazy old guy away from me, will you Threepio? I'm gonna have enough trouble without babysitting him! At the celebration, the regent Zelor challenges "Marcus" to a friendly duel with laser swords which Luke purposely loses to keep suspicions off him. Luke is then approached by Captain Traal who asks "Marcus" to kill Prince Denid and "Loren" which "Marcus" agrees to. At this point, we learn that Captain Traal, Zelor, and Anod are all intent on remaining in power. Additionally, the regent Zelor is going to also kill Captain Traal and Anod and frame Marcus. The next day, a pre-coronation hunt takes place where the hunters ride large frog-like creatures called Ycaqts and chase small rodent-like creatures called Mrids. Participants include Prince Denid, Prince Anod, regent Zelor, Korl Marcus, Loren, and Captain Traal. While this hunt is taking place, C-3PO and R2-D2 have taken Jedidiah to a medical droid to learn he cannot be cured. Princess Leia: D-Denid? What happened? Prince Denid: Anod tried to kill us, Leia ... but he must have set his blaster on stun! Poor Anod ... he was always the loser! Luke Skywalker: He's not the only one, Prince ... Somehow, this valiant old man found the strength and the wits to save my life ... but lost his ... He did that for me ... though I scorned and derided him in my heart! He lost his life, and I lost him! Excuse me ... we losers would like to be alone! Luke Skywalker: I thought you were just a crazy old man. But I was wrong. Your was the soul of a true Jedi Knight ... the last Jedi ... I pray that I meet death as valiantly as you did ... May the Force be with you, Jedi ... forever! There are a lot of coincidences which is typical for a story like this. One has to assume the distress signal was only recently repaired and activated. It conveniently allowed Prince Denid to be rescued and returned to his homeworld on the same day his brother was to be coronated. Zelor just happens to be good at dueling and tries to kill Luke using his laser sword instead of shooting him in the back. The alien that Luke scorns being named Jedidiah with the short form of his name being Jedi is another coincidence. Throughout the story, Luke is out of character. First, his disdain for Jedidiah is not typical Luke behavior. Additionally, there are strong hints that Leia and Denid are involved which Luke reacts to very childishly. In The Empire Strikes Back Luke's character grew beyond the immaturity he displays here. The cover art is by Walt Simonson. Luke is brandishing his lightsaber over the fallen Leia. Both Jedidiah, with his wooden stick, and Prince Denid are shown while a larger image of Captain Traal is in the background. Captain Traal is the first female Imperial in any Star Wars story. As is the case for most Imperial officers, she is self-serving and only thinks about amassing power. The difference between Traal and her male counterparts is she uses her feminine wiles to attempt to sway others to do her bidding as she does with Luke several times in the story. 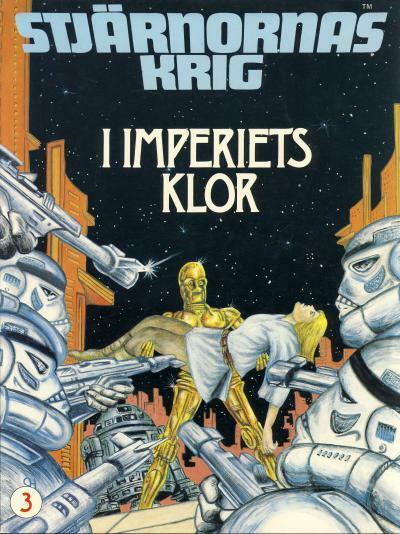 I Imperiets Kor or In the Empire's Claws is the third Star Wars album released by Semic Press in Swedish. Released in 1979, Stjärnornas Krig Album #3 includes The Wheel saga from Star Wars #18 - 23. 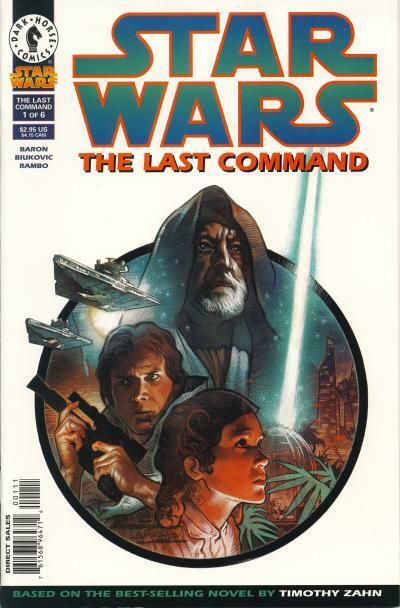 The cover artwork is a redrawing of the cover for Star Wars #18. Like Brandon Badeaux's interiors on the Rebellion title, this cover appears to be printed without the pencil work being inked. Both Star Wars #34 and 35 are top 10 books in August and Star Wars continues to reign over Marvel's other ongoing series. Indications are the numbers for the comic industry in August 2017 look really bad compared to August 2016; units shipped are down over 25% compared to last year's August sales. This has been a down year overall with comic sales off almost 7% compared to last year at this time. To be fair, DC had their line wide Rebirth launch in 2016 and Marvel still has their Legacy launch coming in the next few months, so it is still possible for things to turn around. It needs to be noted that the total estimated unit sales is based on the preliminary units sold as calculated on the Comichron website. It does not include subsequent printings, which would make 2015 look even better than it does. 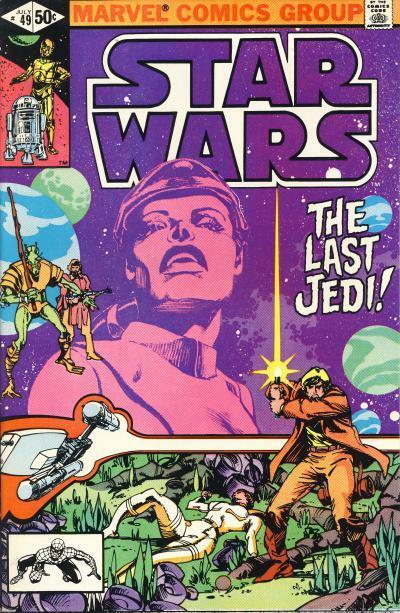 Obviously, Star Wars #1 is an giant, having sold over 1 million issues by the time you add in the subsequent prints. If you remove #1 from the equation, the top selling issue in 2017 is Star Wars #4 (again, not counting subsequent printings.) Without Star Wars #1 in the equation, the average sale this year is less than half of 2015. Now, consider the main Star Wars title has been Marvel top selling ongoing series for nearly 3 years. Star Wars has been a top selling title with weak competition. Do not get me wrong, Star Wars is by far more entertaining than anything being put out by the Big 2. And I believe it should be a top seller. But, the title probably wouldn't be a top 10 book if the rest of the Big 2 titles were doing better. In a way, I wish the other comics were performing better so Marvel had to work a bit harder to keep high sales on their top selling ongoing title. Comichron released the August 2017 preliminary numbers in their post August's comics orders can't compare to 2016's Rebirth boom; Dark Nights: Metal, Paper Girls top charts. These days, it takes a bit of work to keep up to date on the variants and exclusives being released. Adding to the confusion is when retailers join to commission exclusives together. Frankie's Comics, Sad Lemon comics, and 7 Ate 9 Comics all released three shared exclusive covers for Doctor Aphra #1. The standard exclusive is limited to 3000 copies, the black & white exclusive is limited to 1500 copies, and the virgin exclusive is limited to 500 copies. 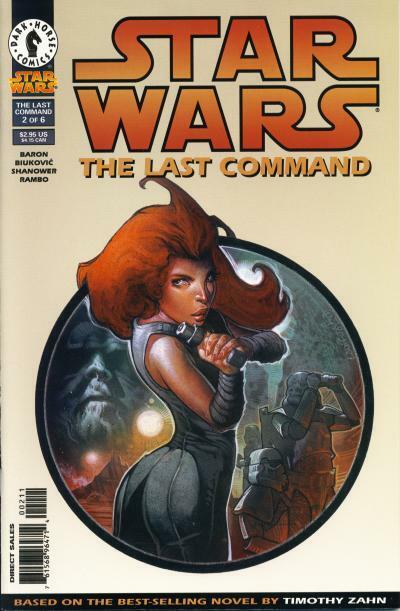 The cover is by Italian artist Sara Pichelli who has drawn several variant covers for Marvel's Star Wars line. 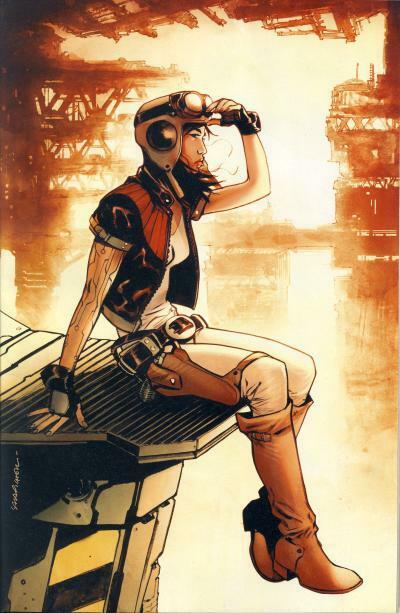 Depending on the artist, Doctor Aphra looks either Asian or Caucasian. Sara Pichelli's cover shows her as Asian. 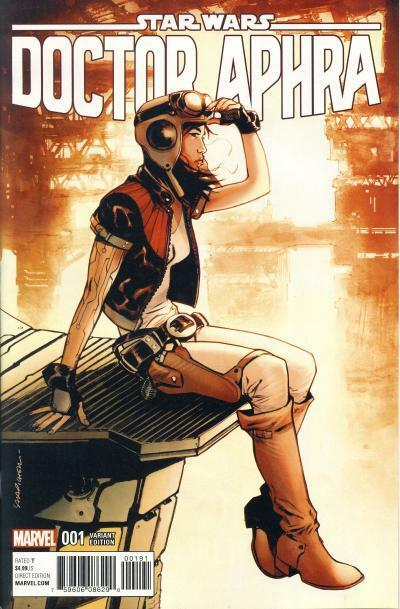 It is a nice cover showing Aphra sitting on a platform high up in the air peering off into the distance. Grandreams published Star Wars Annual 1981. 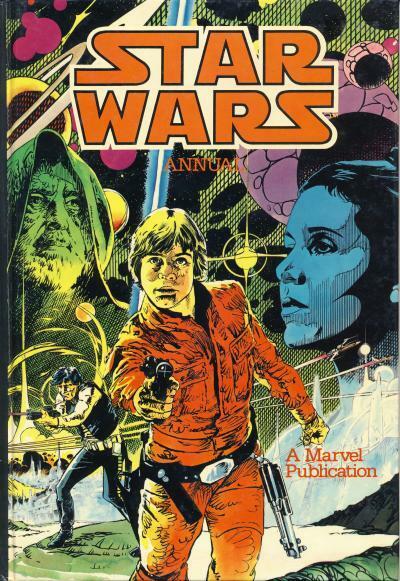 The content of this hardcover book includes Star Wars #45, 47, and 48.
contains Star Wars #45, 47, and 48. The colorful cover is drawn by British artist Paul Neary. Neary was the editor-in-chief of Marvel U.K. in the 1990s. During his time as editor-in-chief, he oversaw the launch of line of U.S.-sized comics (traditional British comics are magazine-sized) that were also marketed and sold in the U.S. The first five titles were Death's Head II, Knights of Pendragon II, Motormouth, Warheads, and Hell's Angel. Initially, these titles sold very well and the line expanded quickly, but the entire comic market crashed in 1993. Marvel U.K. became a victim of the crash and it's assets were sold to Panini Comics. 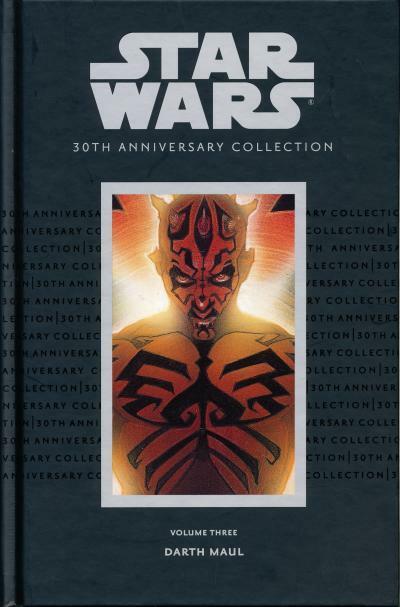 The third volume in the Star Wars 30th Anniversary Collection from Dark Horse reprints the 4-part mini-series Darth Maul. Like the other volumes in this series, it has a matte black cover with the text in silver. Framed in a silver box in the center of the cover is a portion of the cover art from Darth Maul #4 by Drew Struzan. Drew Struzan is best known for creating posters for movies such Indiana Jones, Harry Potter, and, of course, Star Wars. This volume retailed for $22.95 and was limited to initial orders. 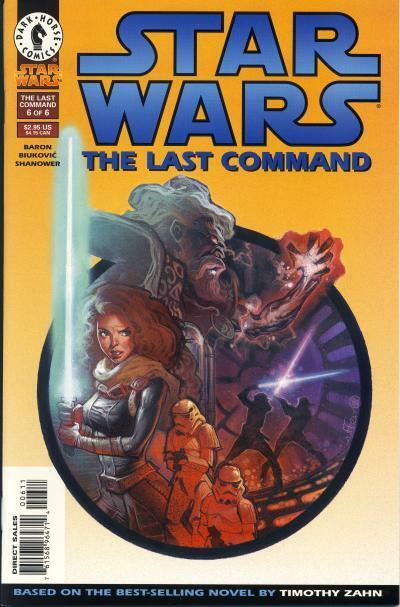 The original series came out in 2000 and was the first of three mini-series from Dark Horse to star Darth Maul. Each issue of this mini-series shipped with both an art cover and a photo cover. It was long rumored that The Force Awakens was going to be about the children of Luke Skywalker, Princess Leia, and Han Solo. 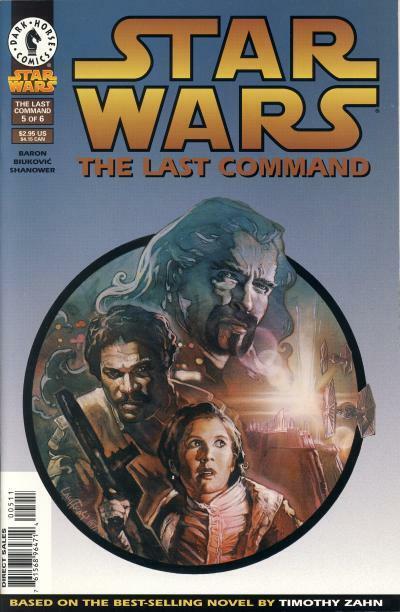 That rumor led to two comics spiking in value prior to the release of the movie: Dark Empire II #5 which has the first comic appearances of the twins Jacen and Jaina Solo and Star Wars Tales #19 with the first comic appearance of Ben Skywalker. Jacen, Jaina, and Ben are all characters who are featured prominently in the now defunct Expanded Universe. 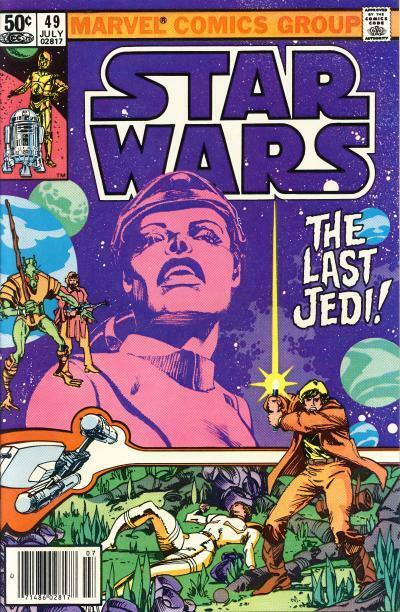 Ben Skywalker appears in the 8 page The Lost Lightsaber story in Tales #19. 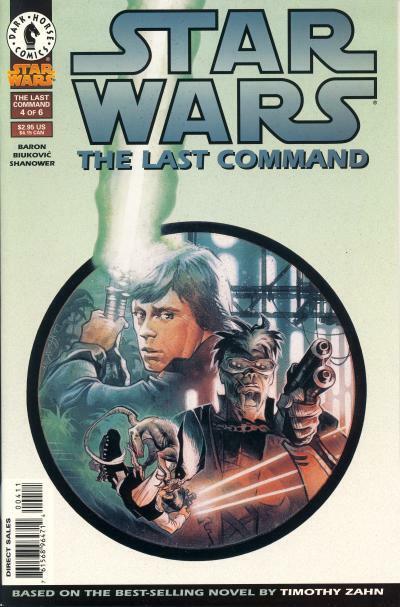 The short story follows the lightsaber lost by Luke during his battle with Darth Vader on Cloud City. The saber is possessed by many owners, including Bossk and Boba Fett, before it is found by a Jedi Knight who gives it to his Jedi Padawan. The Padawan uses it to kill his master and, many masters and years later, that former Padawan is about to perform a ritual with other Dark Side users to "infuse this lighsaber with the power of the Dark Side." At that moment, the Jedi Knight Ben Skywalker appears and takes the lightsaber exclaiming "This belonged to my father." Ben Skywalker is the son of Luke Skywalker and Mara Jade. Another rumor was The Force Awakens would start with the movie's heroes finding Luke's lost lightsaber and it would follow their quest to find the missing Jedi Master. While Luke's missing lightsaber is in the movie, it is not the impetus for our heroes wanting to find Luke. Even so, it is interesting that the story in Tales #19 deals with the subject of the lost saber and also has an appearance by Ben Skywalker. The art cover is based on this story. Into the Unknown is a 10 page curiosity for Star Wars fans because it features a crossover with Indiana Jones. 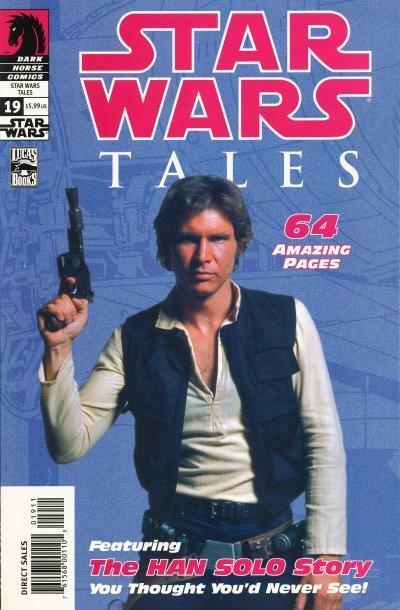 This tales is the Han Solo story you thought you'd never see! shown on the photo cover. Dark Empire II #5 does not command the same prices it was seeing a few years ago. 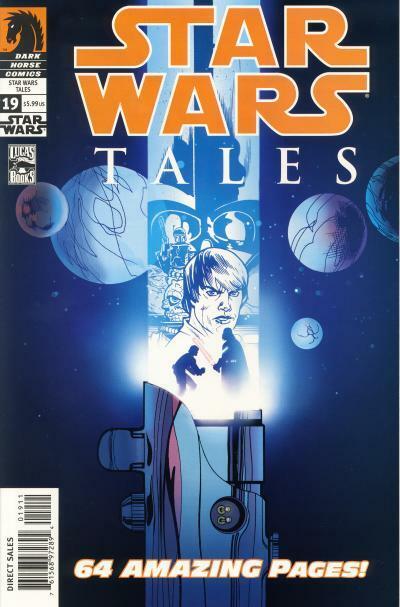 Star Wars Tales #19 however still fetches a decent price. The photo issues have a slight premium over the art issues. The art issue can fetch from $30 - 45 in NM condition and you can expect to pay about $5 more for the photo issue. Luke Skywalker: "No, my father didn't fight in the wars. He was a navigator on a spice freighter." Obi-Wan Kenobi: "That's what your uncle told you. He didn't hold with your father's ideals. Thought he should have stayed here and not gotten involved." Luke Skywalker: "You fought in the Clone Wars?" Obi-Wan Kenobi: "Yes, I was once a Jedi Knight the same as your father." Princess Leia: "General Kenobi, years ago you served my father in the Clone Wars. Now he begs you to help him in his struggle against the Empire..."
Mara Jade: "Let's get one thing clear right now, Skywalker. I work for Karrde, and Kardde has already said that we're staying neutral in this war of yours. The only reason I'm here is because I know a little about the Clone Wars era and don't want to see a bunch of cold-faced duplicates trying to overrun the galaxy again. The only reason you're here is that I can't shut the place down by myself." Clones are grown in Spaarti cloning cylinders and the process, which takes about a year, has the potential for clone madness. The Dark Jedi Joruus C'baoth, enlisted into Thrawn's campaign against the New Republic in Heir to the Empire, is one of these insane clone. Thrawn is using the technology in Mount Tantiss to create his own clone army to man the recently recovered Katana Fleet's Dreadnaughts. He also is short-cutting the process and his clones are being grown in less than a month thanks to the use of the Force repelling ysalamiri. Luuke Skywalker, a clone of Luke, is a clone grown using this accelerated process. For almost a decade, the Clone Wars described in the Thrawn Trilogy was what Star Wars fans knew, until the release of the prequel trilogy. With a definitive explanation for the Clone Wars, the situation about insane clones introduced in the Thrawn Trilogy was retconned into continuity as a separate event. Dark Horse published a 6-part mini-series for the final book in the trilogy. Yet another artist provides the interior artwork, Croatian Edvin Biukovic. His artwork is a blending of the European style seen in the first mini-series and the traditional U.S. style seen in the second mini-series. 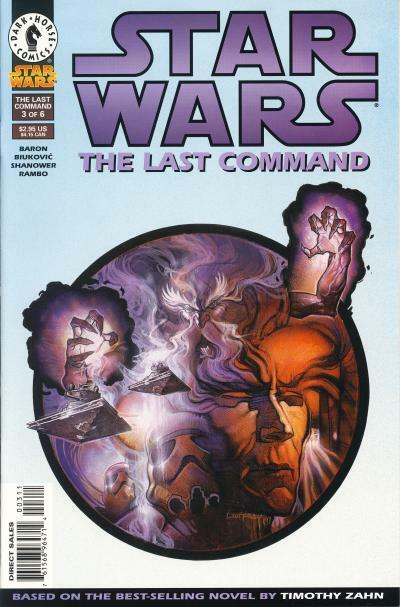 Like the previous two mini-series, the cover art for The Last Command is provided by Mathieu Lauffray. Like the novel it is adapting, this mini-series is fast paced and juggles many characters and situations. I believe each novel in the trilogy is more dense than a single two hour movie could contain and it is amazing how much story is squeezed into 6 issues.